The term ‘UX’ is still considered a jargon in many companies. By now, most of the people do know that UX means user experience but don’t go by its face. It is not just about drafting the interfaces. It is beyond that. It kicks in at the strategy phase and plays a pivotal role. Companies strive to create positive, consistent, predictable, and desirable outcomes with UX, which may include interface, industrial design, physical interactions, and more. UX helps in conducting user research and analysis and delves into every step of the product lifecycle. It is UX that dictates the plan of action in every business and influences the policies that are targeted towards enhancing the user experience. The following is a list of the most common UX misconceptions that are encountered in the building of apps and websites. Unlike many who believe that user experience design is confined to interfaces, it is a far broader process that starts from the first step of strategizing to ultimately affecting the entire lifecycle of the project. UX design has a crucial part in defining the business strategy and providing baselines for business decisions. UX design works from defining the user experience to designing for the user experience. Yes, an expert can find major usability problems, but usability tests always reveal surprising issues. Experts sometimes miss the real problems that cause users to fail tasks. Thinking that experienced designers do not have to test their products is one of the greatest misconceptions in web design. White space or “negative space”, referring to the empty space between and around elements of a design or page layout, is often overlooked and neglected. Many consider it a waste of screen space but it is an essential element in web design. For designers, white space is as important as the content. White space can bring elements of the content into focus. It leads the viewer around the page by the designer’s intent. Many users do not wish to adapt to the conventional user interface design patterns. They would rather create something of their own or maybe reinvent what is already in there. But, what is to be taken into consideration here that the design patterns often rejected by designers are the ones that have been tested and have been functioning. Users have an understanding of how they function and, I believe, the users appreciate usability over novelties. Standard patterns will eventually benefit the audience. You may still feel that a new outlook is needed but before you apply that you need to be a hundred per cent positive that your perspective or new pattern is better than the existing pattern. Because maybe the great design solution you seek is probably already out there. Small details go a long way. One needs to pay obsessive attention to details, down to the smallest bits. Fine details, such as an informative error message, or the orders in which products are shown on a category page, strongly impact the user experience and the bottom line. There is a very short space of time and limited interaction to shape the experience for the customer. The customer can be pleasantly surprised by the little extras: the attention to details and speed of service. This will guarantee that your customers come back to you and even tell about you in their social circle. Redesigning a website is basically done to increase conversions and attract new customers. But sometimes this strategy may backfire too. It has been reported that many users hate change. It doesn’t matter if the new design is better than the original one. Google, Yahoo and Amazon follow this strategy with great success: you can hardly see significant changes on their websites. Designers should approach redesigns very carefully. They should consider the business reasons and the switching cost for users in the first place, and also decide whether minimal changes would suffice. Decorative images are frequently used to emphasize a certain page element but it turns out that this technique often makes the element less visible. It has been stated that photos and other decorative graphic elements rarely add value to a website and even less to a mobile app. They tend to harm than improve the users’ experience. Users usually overlook stock images and might even get frustrated by them. Instead users look for content and ignore unrelated visual noise. It’s great when we are offered choices in life. It makes us feel more in control of the situation. But unfortunately, it is not the same when it comes to choices in website features. The more choices a website or web application offers, the harder it is to understand the interface. This leads to decision paralysis and it gets frustrating. It is a paradox but people are more likely to make a purchase when offered only a limited number of choices. One of the best examples of this is Apple. Apple has consistently produced products that are minimalist in design, task-focused and consistent. A very common mistake that people make in web design is that they believe that graphics make a page element more visible. They try to emphasize an important piece of content with a graphic-heavy and flashy presentation. This approach, however, often makes it less visible. When people are looking for a particular thing on the website, they look for texts and links where the required information can be found. People often end up mistaking visual or colourful page elements for ads and end up ignoring them. This three- click rule has been a hot topic for a very long time now. But contrary to the popular belief, people don’t leave your site if they’re unable to find the desired information in 3 clicks. In fact, the number of necessary clicks affects neither user satisfaction nor success rate. That’s right; fewer clicks don’t make users happier and aren’t necessarily perceived as faster. It’s not the number of clicks but the well-labelled links with information that play a key role in usability. It has been proved that people don’t quit after 3 clicks and don’t feel frustrated if they have to click more. What really counts here is ease of navigation, the constant scent of information along the user’s path. 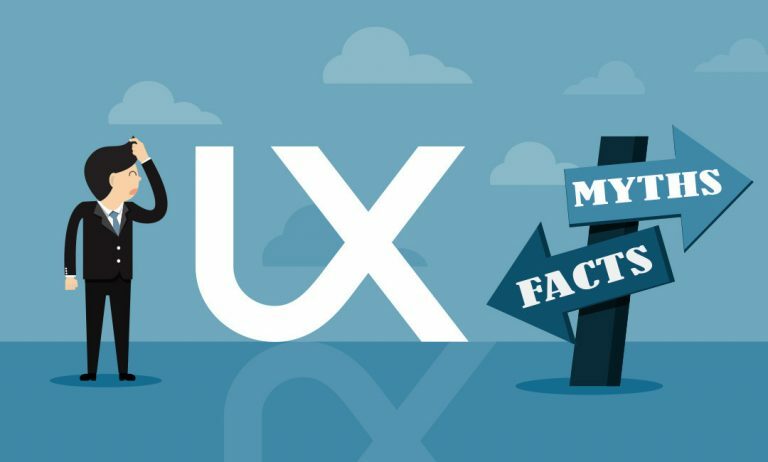 This wraps up my list of 10 most popular UX myths- some of which I am sure have truth in them to remain popular. I hope people start seeing UX for what it actually is and try and get rid of all these myths that surround it. UX design is not a checkbox. It needs to be integrated into everything a company does.